Trauma and adaptation early in life leads to faulty interactions during adult life. Love is complicated. Divorce rates are higher than ever and many people can relate to growing up with dysfunctional parents. Psychologist Elan Golomb has devoted much of her career to the study of love, uncovering unconscious mental and emotional attitudes that most people don’t understand and readily deny. 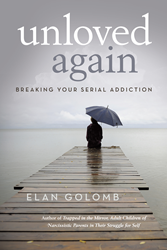 In her new book, “Unloved Again: Breaking Your Serial Addiction,” Golomb discusses how one’s childhood experiences can affect the ability to form healthy relationships as adults. She also helps readers work towards a deeper understanding of themselves in order to create a better future. Golomb is a private practice psychotherapist in New York who spent many years studying her own unhappy experiences until she had her ‘Aha moment’, which inspired her to write “Unloved Again.” For years, she failed to understand her repeated love life mistakes, until she made the choice to find someone she could really love, and someone who could love her. For more information, visit https://elangolomb.com/. Elan Golomb earned her doctorate in clinical psychology and her certificate in psychoanalysis and psychotherapy from New York University. She has been in private practice in New York since 1972. She is the author of “Unloved Again: Breaking Your Serial Addiction” and “Trapped in the Mirror: Adult Children of Narcissistic Parents in Their Struggle for Self.” She currently resides in Brooklyn.